I have already published most of my maps under the GPL a while ago, and the map files are included in zip downloads here. Now, I took the time to create a repository on Github that contains the source files for all of my maps. You can get all maps files at once using a git client, or simply download the whole repository as a zip file from github. For more information, see the README file in the repo or just visit the GitHub page of the repo and scroll down. Feel free to use the maps under the terms of the GPL! As some of you may know, I've been running a blog that occassionally contained some posts related to level design at dfspspirit.wordpress.com. I just wanted to announce that I have decided to move the blog to my own webspace, and it can now be found at xsmd.org/brain/. Most likely people visiting this mapping website will be interested mostly in the 3D design category. In case you want to know the reasons for this move: I never liked the advertisements at wordpress.com, but what I found worse was the tracking. The new version of my blog is hosted on my own webspace and of course has no ads or tracking. I also made several adjustments to the wordpress theme to further improve the privacy of users. The 10th mapping contest at the Quake 2 Cafe is over and the scores have been published. 20 maps were judged and my entries placed 3rd (spirit2dm3) and 1st (spirit2dm9). Check out the screenshots and get all the great maps at Q2C! My new maps are also available in the Quake 2 section of this site now. I have written a guide on designing multiplayer FPS maps, with a focus on item placement. It is focused on the Quake series of course, and uses Quake 2 as an example. This guide does NOT talk about technical stuff like editors, vis, or whatever. It is about designing map layouts and item spots that make a map play great, not about placing brushes. You can read it on my blog, here: FPS level design and item placement guide by spirit. I have two maps ready to submit to the mapping contest at the Quake 2 Cafe. The judges are gonna have a hard time though, since more then twenty mappers have signed up for the contest! The Quake 2 Cafe, which is still alive in 2015, has announced a new mapping contest. It's been some years, and I also haven't touched a level editor in quite a while. I decided that I will give it a try though if time permits. Jay Dolan has added some great new features to Quake2World recently, including planar projection shadows and an in-game material editor with a great user interface. Jay also worked on GtkRadiant, my favourite editor. You should really check this out. As you may have noticed, maps.sp1r1t.org is gone and all its content is now here at maps.rcmd.org. And I uploaded screenshots of some of my maps to picasa here. You can now grab spirit2dm7 here. It's a tourney/DM map that I made for the 1st mapping contest at Q2R. See the readme for more info. I guess I'll take a break from mapping now that this map is released. I'd like to spend more time on photography and other things for a while. I just released spirit1dm3 -- Zeal & Fury for NetQuake and Quakeworld. The release threads are at func and quakeone.com. The 8th mapping contest at the Quake 2 Cafe is over and the scores have been published. 10 maps were judged and my entries placed 2nd (spirit2dm6) and 3rd (spirit2dm5). Check out the screenshots and get all the maps at Q2C! You can play them online at tastyspleen (US) and airrocket.net (Europe). Auto-download of the maps should work on both servers, see the thread fore more info. I am currently working on a map for Quake. It's a tourney map intended for both NetQuake and QuakeWorld and you can get the beta in the Quake section. The beta threads can be found at QuakeOne.com and leveldesign.nl. I also updated my compileq1map shell scripts. They now support different compilers including hmap2 by lordhavoc, Tyran's Tools and Bengt Jardrup's tools. I have submitted 2 maps for the mapping contest at the Quake 2 Cafe. All judges got the maps and judging has started. Expect results soon! The guys over at the Quake 2 Cafe have started their 2010 mapping contest. The idea is to create a standard deathmatch map that doesn't require a special mod. Many mappers have already signed up but I guess they could still use a few judges so if you're interested head over there asap. I'll definitely submit a map, maybe even two. I recently started playing some RTS games again and got myself Dawn of War with the expansion packs for a few bucks. The game's already a few years old but it still looks and plays great. Of course, I also had a look at the mapping tools and they are really great and well documented. So here's my first DoW map: Green Hell, a 2vs2 Multiplayer/Skirmish map. My first serious try at making a Quake 1 map, spirit1dm2 -- Ultima ratio , has just been released. This was made possible by a lot of help and suggestions from the quakeone.com community. The FrikBot waypoints that come with the map were made by Lightning_Hunter. =peg= made many good suggestions and put the map on bigfoot.quake1.net, thanks heaps to both of you! You can get the map and have a look at more screenies here. Prefer videos? No problem. Here's one that shows me running through the map: watch it at youtube or download it here (wmv, ~5 MB). If you prefer to laugh at my (lack of) quake skills, try the following video instead (me vs. FrikBot): youtube | download (wmv, ~5MB). A screenshot of the map also made it to Planet Quake, thanks guys! I've been working on a map for Quake 1 and Quakeworld lately. As you may have guessed, it'll be a tourney map :). It goes by the name spirit1dm2 -- Ultima ratio atm and both a beta version and some screenies are already available, so head over to the Quake 1 section now! I'm currently converting spirit2dm4 for Quake2World. This means replacing all textures with high-res versions - and rescaling the texture of every brush of the map afterwards. Doing that manually in radiant seems pretty boring to me so I wrote something in perl that does exactly that. It supports only q2w atm but it's easy to extend it. You can get it here. My map spirit2dm4 -- The Healer has been released for Quake 2. Check out the screenies and grab the map here! I finally took the time and updated the readme files of most of my maps. Now the .map files of spirit2dm1, spirit2dm2, spirit3dm1, spirit3t1, spirit3t2, spirit3t3, spirit3t3a and spirit3ctfduel1 are officially released under the GPL. You can find the source files in the zip/pak/pk3 files. And there's more good news: the 7th mapping contest at the q2c is over. Eleven maps have been submitted so expect some cool releases soon. I submitted a new Quake 2 tourney map that I made in 5 days: spirit2dm4 -- The Healer . Still working on spirit2m3, a larger DM map. The levelmakers.com community website has been down for a few weeks and we are sorry to announce that it's most likely gone for good. We'd like to say goodbye and thanks to everyone who visited the site. Levelmakers.com was hosted on Astrocreep's server and he put a lot of time into building it up and maintaining it. He also was quite active on the forums until he suddenly disappeared. He seems to have fallen off the planet, his blog at haulin18.com is also down and he didn't reply to mails in months. We all hope he's fine. Discussions on what to do with the website have been going on in the moderators forums for quite a while but there was next to nothing we could do. None of us had filesystem or database level access to the server so we could neither update nor backup it. Now the account was removed. Seems everything that was there is lost. A lot of work recently went into lilith for q2w and the new version with normalmaps by keres, improved lighting (thanks Jay!) and a few bug fixes is now available. Check out the blog at the offical q2w website and the description and screenshots of the map. I just updated the q2w edition of my map 'Awaiting Resurrection'. The new version has normalmaps (made by keres, thanks man! ), some plants and some terrain that uses q2w's terrain blending feature. A few small bugs were also removed. You can see a screenie of the version here. The 6th Mapping Contest at the Quake 2 Cafe is over and the Quake 2 edition of my map lilith (spirit2dm2) placed 2nd out of 9 maps. It is now officially released and available in the Quake 2 maps section for Quake 2 and for Quake2World in the Quake2World maps section of this website. As the map was planned and created for Quake2World in the first place, I recommend to play the Q2W version. It is already in the Q2W svn so all you have to do is install Q2W and type 'map lilith' in the Q2W in-game console. Enjoy! Btw: Don't forget to check out some of the other great maps that were submitted to the contest! Converting my q2w map for the Quake 2 contest turned out to be easier than expected and I've submitted the map some days ago. I've had a look at Terragen and created some skyboxes for Q2W/Q3A with it. You can check 'em out and download them here. I wrote a few tutorials on different things, you can read them in the new tutorial section. There's a Quake II mapping contest over at the Quake 2 Cafe and I'm working on a map for it. It's kind of an experiment though 'cause the map is build with q2w in mind and I'll have to convert the textures and stuff once it's done. Could get messy. The forums over at levelmakers.com are getting more and more active and I recently became moderator of the Quake 2 section of that site. It's a really friendly and open-minded mapping community of level makers. Give it a try if you haven't seen it yet! I decided to release the .map-files of all my maps under the GPL license. Some of the older pk3 files already include the map files, I'll update the license / copyright part of the readme files soon. Note that the GPL only applies to my work (the .map-files), not the textures or models made by others that come with the map. The downloads for spirit2dm1, spirit3dm1, spirit3t1 and spirit3t3a have already been updated, the map files are in the pak/pk3 and the readme files say that they are released under the GPL. My map 'Awaiting resurrection' is now part of q2w and released under the GPL license. Just type 'map resurrection' in the q2w in-game console to give it a try. Thanks to jdolan, Ingar and many others at #quetoo for making this possible. I'm quite happy with the latest changes, but suggestions for improvement are still (and always) welcome. My next map will also be a Quake II map. It'll be called 'In the arms of Lilith'. 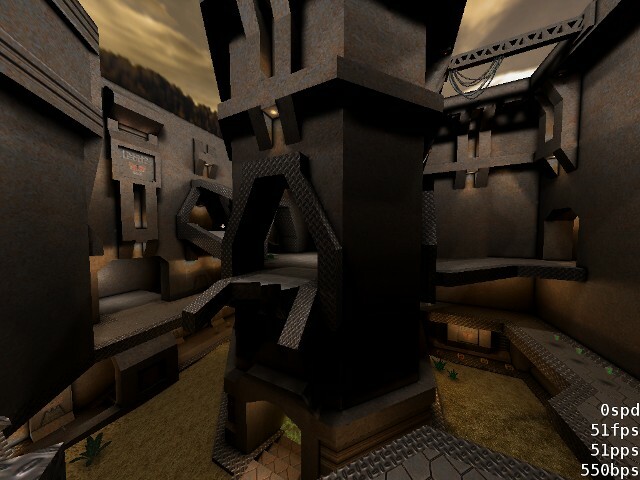 I recently joined the Quake2World team and I'm currently preparing one of my maps for the q2w engine. Here's a first screenshot of what the map looks like in the q2w default renderer. It's still work in progress though. An improved version of spirit3t3 has been lurking on my HDD for quite some time now and I feel it's time to release it to the public. You can read more about the map and download it here. Bad news: when I started q4 today to give a map I downloaded a short try, I noticed that all I felt was casualness. And it wasn't about the map, it was about the game. Working on spirit4dm1 feels pointless, the map will most likely never be completed. Good news: As you may have noticed, a screenshot of spirit3ctfduel1 has been the featured pic on planetquake for some days! Thanks to planetquake for the pimp'n! 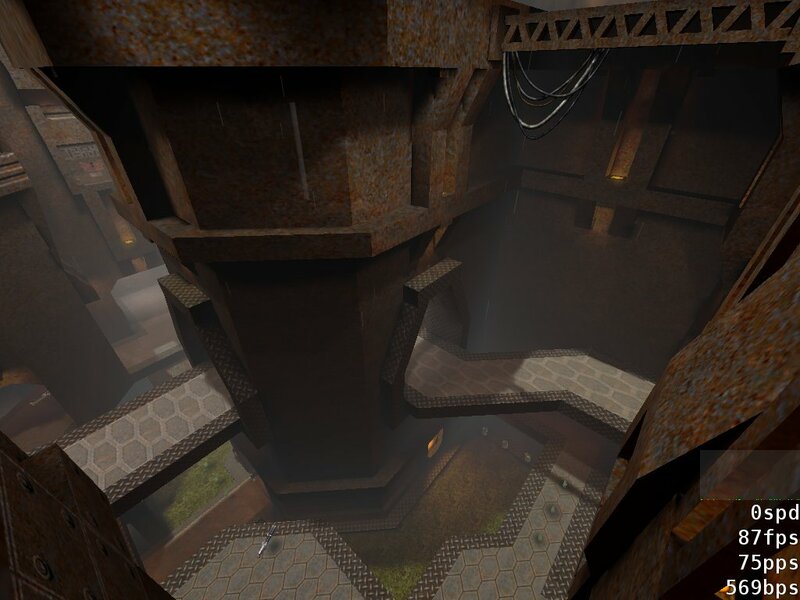 My first CTF map 'Where Fears Collide' is ready to go! It's a small map best suited for 2vs2. Give it a try! I just released the final version of my q3a tourney map spirit3t3. Thanks to everyone who gave feedback and suggestions on the long way to this final release (there were 6 beta versions)! A second beta of spirit3ctfduel1 is available for download and playtesting! I also completed a map for Warcraft 3 / TFT which I recently stated playing thanks to a friend of mine. You can grab it here. After 5 beta versions and lots of usefull feedback over at The Quake 2 Cafe my first map for Quake 2, spirit2dm1, has gone final. Thanks to everyone who made this possible! I just released the final version of spirit3t2 to the public. Changes from beta4 were a number of minor bug fixes and a Quad for TDM. The map is best suited to 2vs2 TDM. I started working on my first map for Quake IV. I'm using the built-in q4edit to create a rough layout atm but it's gonna take some time till the first alpha will see the light of day. The gameplay of spirit3t3 has been improved with the most-appreciated help of some guys over at the CPM forums. RA is more dangerous to get after a re-design of the lower level, Quad has been added for TDM and various small things have been changed. Hope you like the changes. 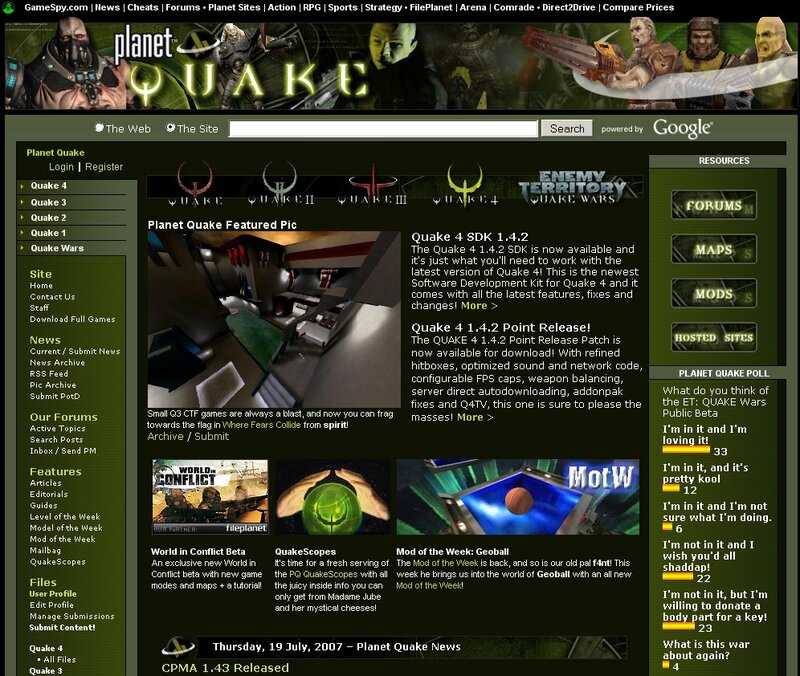 My first Quake II map made it to the news section of planetquake and quite a few people seem to like it as the emails I got and comments over at mc, q3w and the Quake II Cafe suggest. I'm very pleased with beta2 and had some great games on it. I'm currently working on the new design of maps.sp1r1t.org. News related to level editing will now be posted here instead of at the news section of sp1r1t.org.